Old sewing patterns can be pretty darn cool. So you know how the other night the issue of the colour of a dress – was it blue and black, or gold and white? – broke the internet? (You don’t? Ah, well – here’s a summary of that whole thing.) 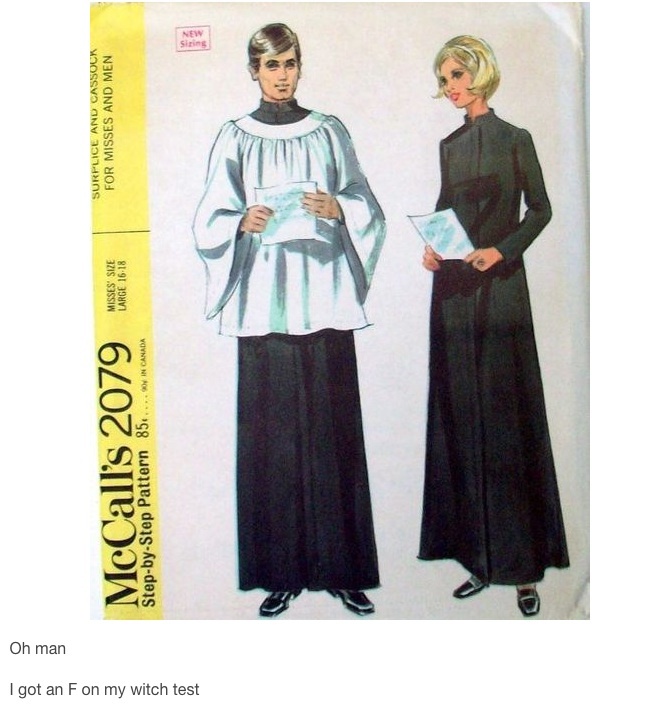 Anyway, today the internet seems to be focusing (albeit with not quite the same intensity) on vintage sewing patterns. 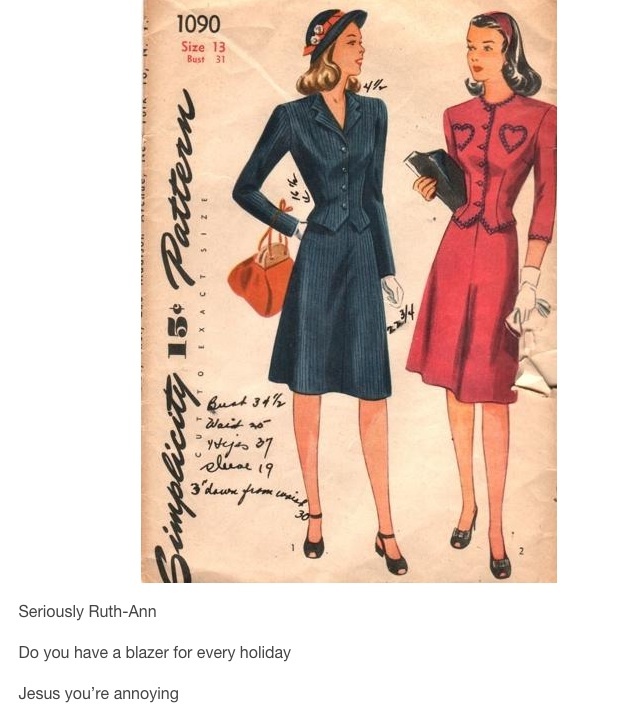 Specifically, a vintage sewing pattern that dances, the one you see at the top of this post and that you are probably mesmerized by even as you read my deathless prose. I had to laugh when I saw this viral GIF, not just because it’s funny – I mean, get a load of the gal in the grey pantsuit in the rear, bobbing her head as her friend (or is it her secret enemy?) 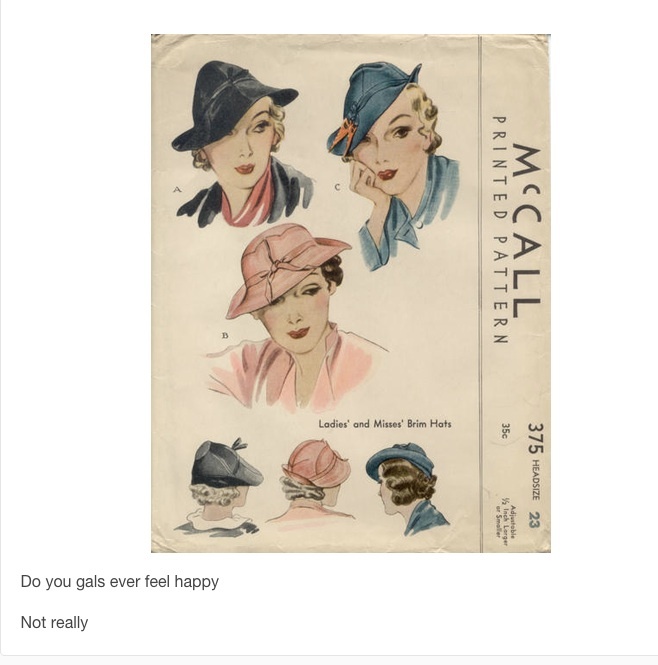 rocks out – but because I have a quiet fondness for vintage sewing patterns. I think, though, that I like those vintage colourful illustrated envelopes containing the patterns for making your own clothes because they remind me of those days of my youth, and of going to Stickwood’s dry-goods store in Madoc – upstairs, where the fabric and the notions and the pattern books were. You’d look through the huge, glossy pattern books and see all kinds of fashionable things worn by svelte models, and then you’d buy your pattern in an envelope, and you’d take it home, and if you were me, you’d make something that looked nothing like the glossy photo that had first attracted your attention. But what the heck. Since Raymond and I bought the Manse and started visiting local auctions and yard sales and thrift shops in search of vintage treasures, I’ve picked up a few of those old pattern packets; here’s one of them, which I think is particularly classic because of the barbecue theme. 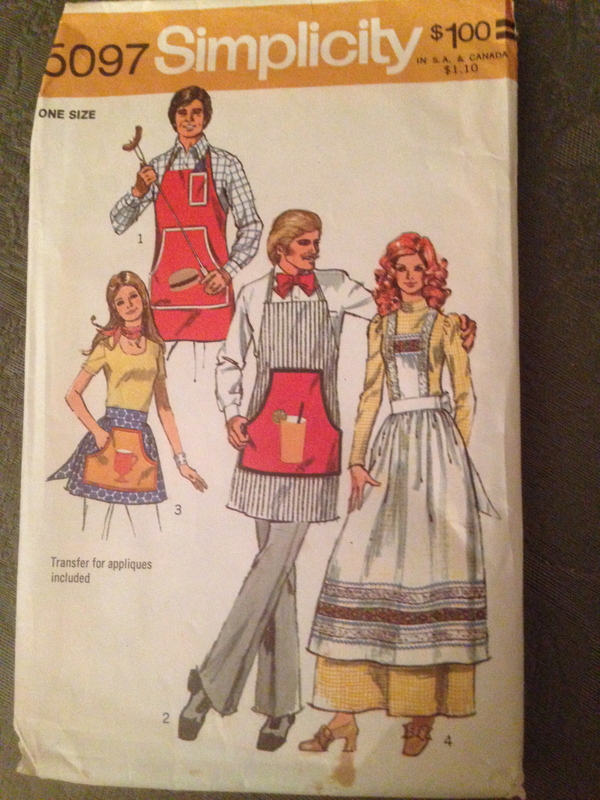 Imagine: sewing all your own barbecue aprons, for both the gals and the guys! 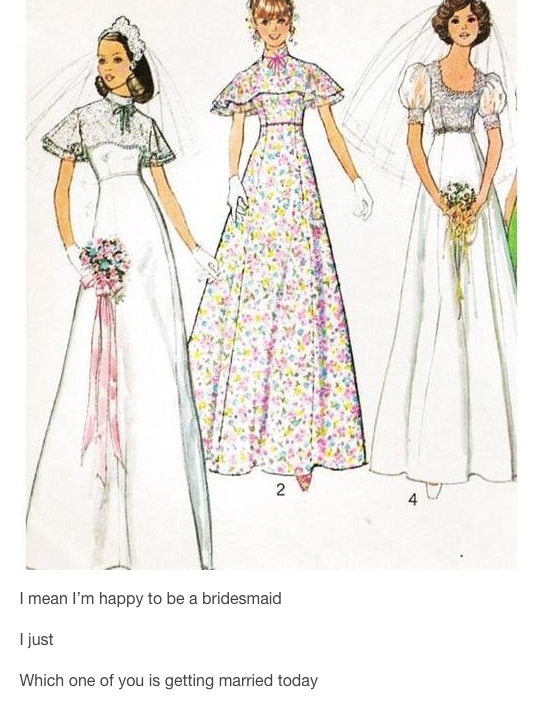 And given my fondness for these old patterns from Simplicity and Butterick and McCall’s and Vogue (those last being the supremely fancy ones, of course), you can imagine how tickled I was to find the dancing pattern all over the internet today. A happy occasion: my friend (and long-ago babysitter) Ann (Roushorn) Sexsmith stopped by the Manse one recent Sunday afternoon to present me with her drawing of our own St. Andrew’s United Church (the church she and I both grew up in) – a drawing that had won her a first-prize red ribbon at the Madoc Fair. What a wonderful gift! As I started telling you good people last night, I thought I’d devote a few posts to the interesting, sometimes delightful, often treasured things that readers have given to me because they know they will have significance for this inhabitant of the old United Church Manse in Queensborough, Ont. 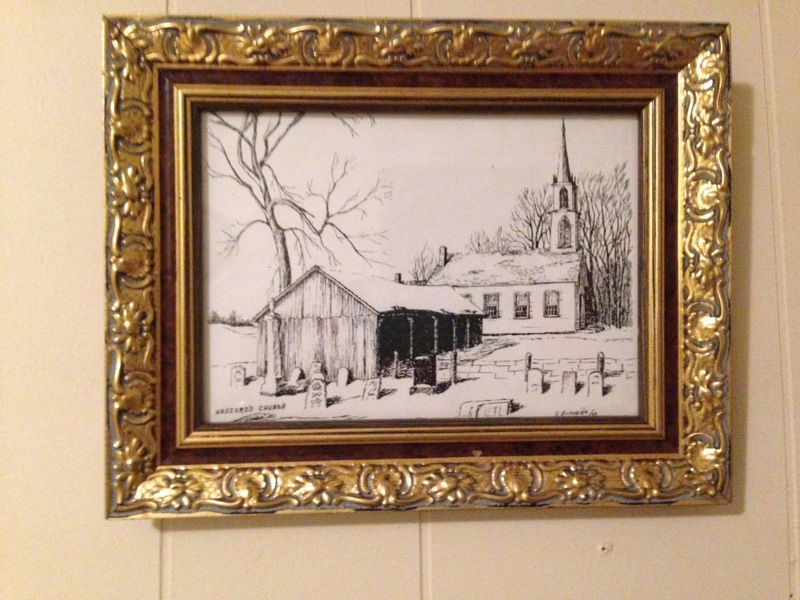 Yesterday’s post was about a sweet little midcentury jewelry holder that now adorns my bedroom dresser; tonight, we turn our attention to pictures of local churches by talented artists. And here are the stories behind the pictures. The largest one, on the left, I’ve already told you about (in a post here); it is a beautiful drawing done by Ann Sexsmith – who, when she was a young teenager named Ann Roushorn, had the unenviable job of babysitting my sister and brothers and me when we were kids here at the Manse. And it won first prize at this past fall’s Madoc Fair! 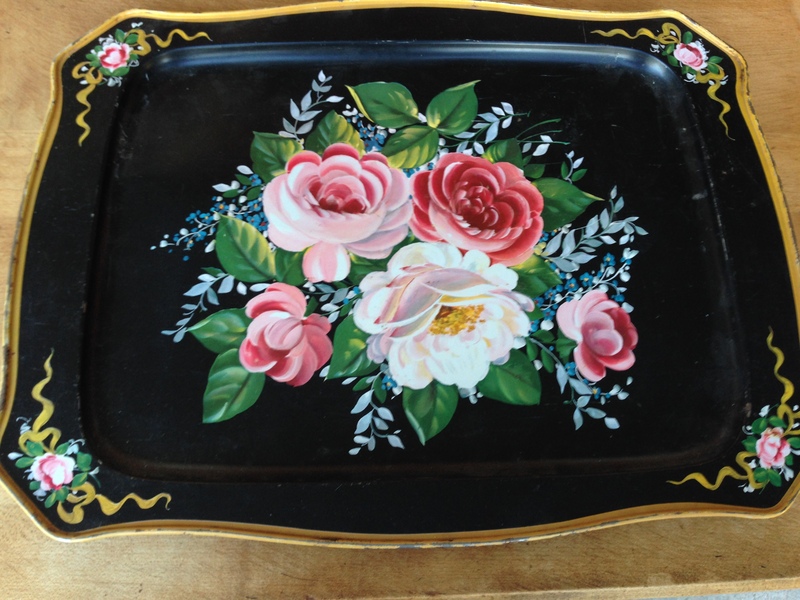 And while I was admiring it and congratulating Ann at the fair, she promised to give it to me! I was a bit taken aback by this extreme generosity, but completely thrilled. And sure enough, one Sunday afternoon after church late last fall, there was Ann with the picture. I made sure Raymond snapped a photo of the two of us with it, to commemorate the occasion. Hazzard’s Church, by Vera Burnside. 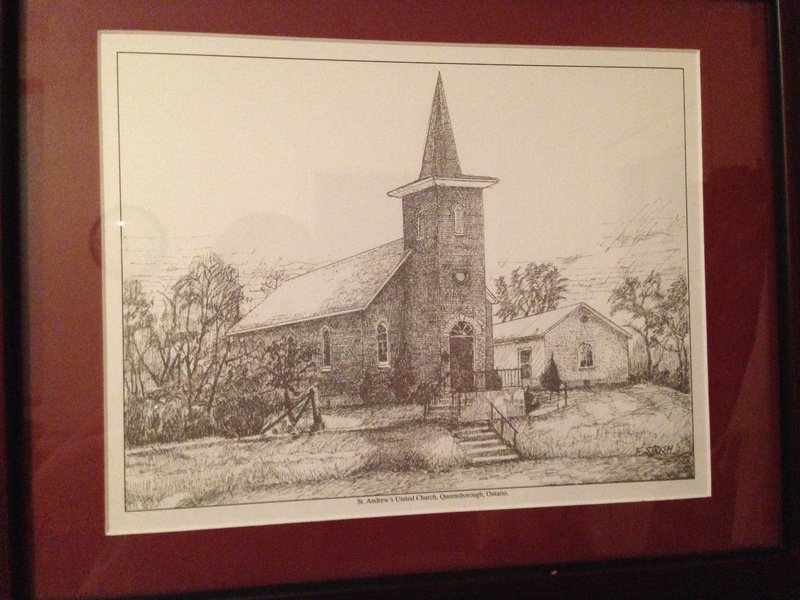 It is a drawing of Hazzard’s Corners Church done by the late Vera Burnside, a talented amateur artist who was also one of the world’s greatest elementary-school teachers and Sunday School teachers. I remember her Sunday School classes very well and very fondly. 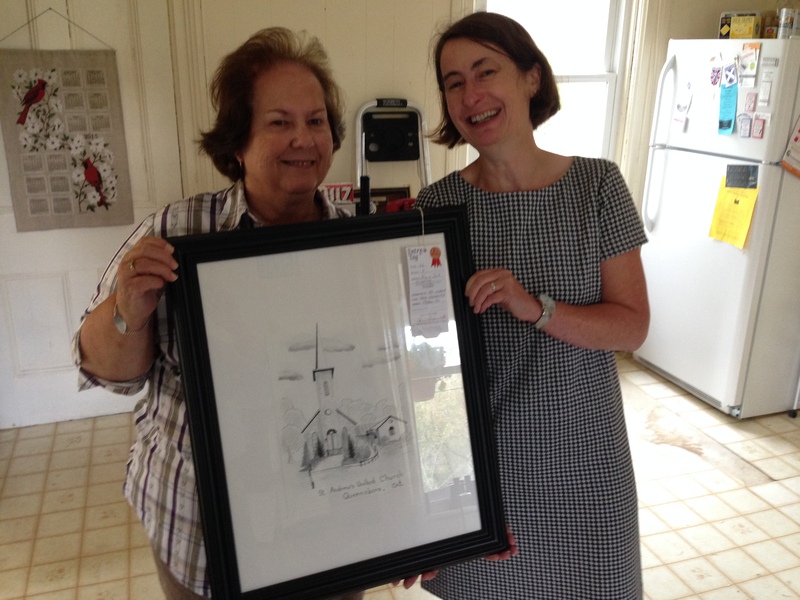 What’s extra-special about this particular framed print of Vera’s drawing is that it once hung at the home of the late Bobbie (Sager) Ramsay, who, like Vera, was a pillar of St. Andrew’s United, and was also a longtime Queensborough storekeeper and our hamlet’s unofficial mayor. (More on Bobbie, including the great story of her secret wedding, here.) That picture was given to me by my friend Barbara, Bobbie’s sister, along with several other treasures. It was a gift that still brings tears to my eyes. A drawing of St. Andrew’s United Church by “F. Strish.” Who is F. Strish? This one was a gift from our friends and fellow St. Andrew’s members Jack and Lois, who just knew – how did they know? – that I would love to have it. 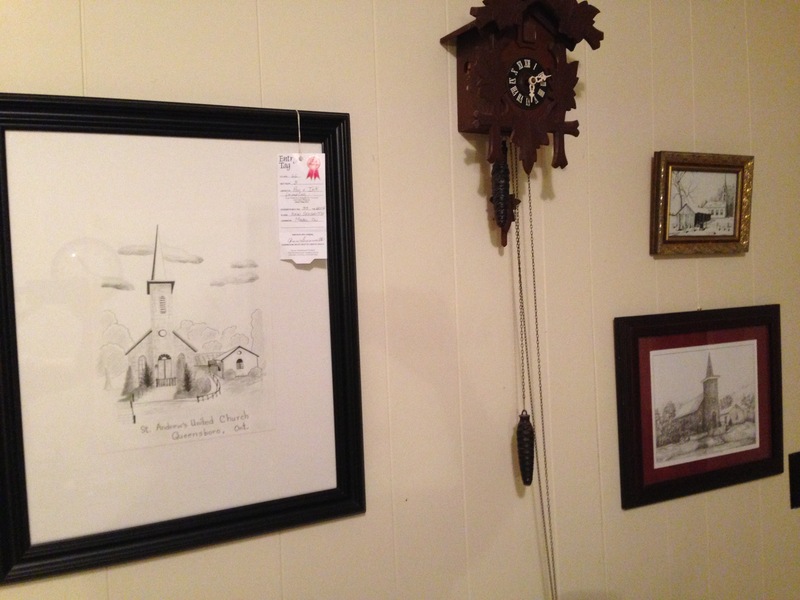 It’s a print of another black-and-white drawing of St. Andrew’s Church, and a very nice one too. But here’s the mystery: who is the artist? The picture is signed “F. Strish,” and I have to confess that that is a name I do not know at all. Who is this talented artist, and how did he or she come to do this picture of our church? Was it a commission, perhaps? I know that someone out there will know. Anyway, while I have previously thanked Ann, and Barbara, and Jack and Lois, for their gifts of these pictures that are so meaningful to me – because of the churches’ local significance, and because my late father, The Rev. Wendell Sedgwick, was once the minister at them – I guess this post is my way of doing it again, and more publicly. I so often feel blessed to be living at the Manse in Queensborough, where I grew up. But never more so than when, out of the blue, an old (or new) friend passes on something meaningful and lovely like these church pictures, saying something along the lines of: “I thought you should have it.” Or: “I thought you would like it.” That’s the nicest gift of all. 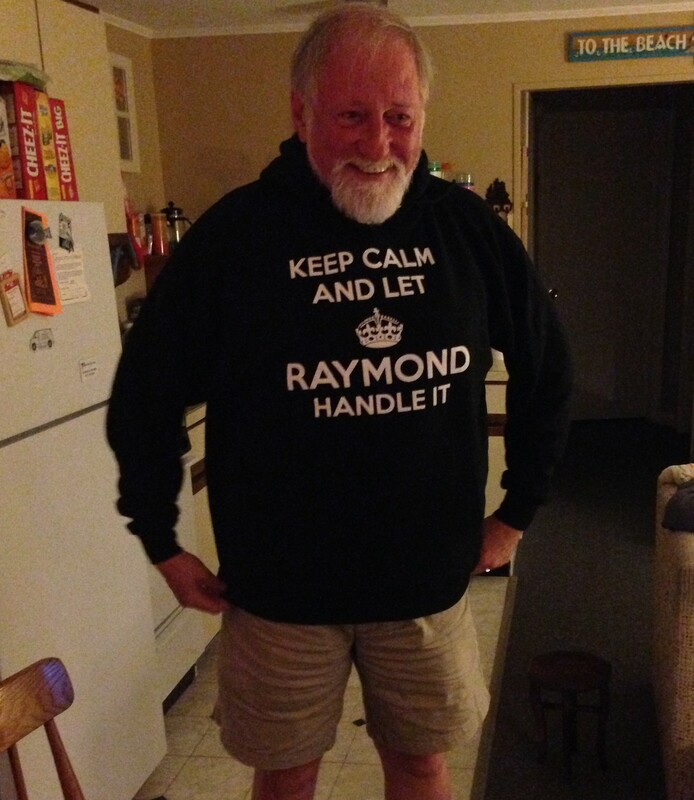 This is my dear husband, Raymond, while we were on a family vacation at the seaside in Maine this past summer – trying on a new hoodie bearing a motto that I think is perfect for his brand-new National Newspaper Awards gig. I am very proud! A good friend of Raymond’s and mine likes to describe what one does when one lives in the country as “pacing the acreage.” In other words, putting on your sandals, or rubber boots, or galoshes, as the season dictates, and surveying what’s doing – what’s growing, what trees need to be thinned out, what fences need mending – out there on your property in the wilds. I know that Raymond likes that idea. But because the Manse is not situated on a very large parcel of land, there’s really not all that much acreage to pace. You can pretty much cover our yard here at the Manse in less than five minutes, unless the condition of the lilac bush or the day lilies requires some particularly close examination. And someday, I am sure, he will acquire a nice little (or not-so-little) local acreage to pace to his heart’s content. Hey, maybe he could purchase a sugar bush and start making maple syrup! But for now, that country-gentleman routine will totally have to wait. Because Raymond has just taken on a position that puts him right smack back into the middle of the Canadian news-media milieu, the one he left behind not very long ago when he retired after a long and universally respected career as executive editor (and before that, managing editor, and before that, city editor, and so on) of the Montreal Gazette. Raymond Brassard has joined the NNA administrative team as Editorial Consultant. He replaces Paul Woods, who has joined the Toronto Star. Brassard worked as an editor at the Montreal Gazette for 30 years, including stints as news editor, life editor and city editor. He was appointed managing editor in 1995 and executive editor in 2010, before retiring in 2013. He will be responsible for the recruitment and assignment of judges to the 22 categories, rule compliance for entries, external communications and the creation of materials for the annual awards gala. So there you go! Something to keep Raymond from pining for that large acreage he does not yet have to pace, as he renews ties with all the good and interesting people from the Canadian media world with whom he’s worked and rubbed shoulders for so many years. I know I am wildly biased, but: there is no better person for this job, which is all about recognizing excellence in journalism. That is something to which Raymond has dedicated a large part of his life. Now, this new role is obviously going to take away from his time for checking out auctions and making dump runs and, yes, pacing the acreage. But personally, I think Raymond is going to thrive on the mix of fast-paced, big-city-based journalism stuff and his country-gentleman existence (pining for the acreage to pace) in Queensborough. “Hazzard’s Church,” by Vera Burnside. A wonderful drawing by a very talented local artist (more on that below), and especially important because it shows the long-gone old drive shed where the horses would have been parked during services in the church’s first century or so. (Am I dating myself if I tell you that I remember that drive shed? Oh well, what the heck.) 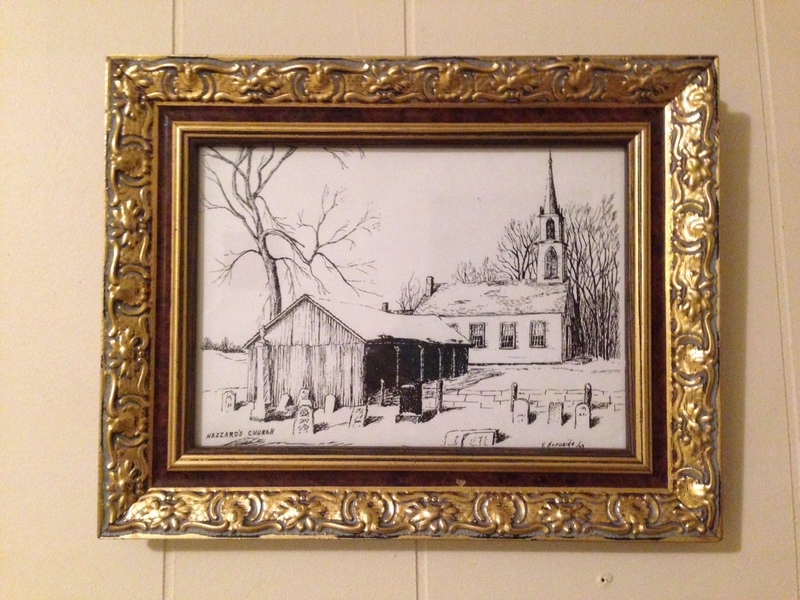 This framed edition of the drawing belonged to Bobbie Sager, one of the brightest and most important lights Queensborough has ever seen, and a great friend of Vera. And now, thanks to a gift from Bobbie’s sister Barb, it hangs proudly in the kitchen of the Manse. I received a truly wonderful Queensborough-themed gift a while back, one that moved me almost to tears. Actually, excise that “almost.” There were tears. And it is high time I told you about it. In fact, it was more like a gift package, because there was more than one item. A bunch of stuff, actually, all of it delightful. But three of the items were, and are, particularly close to my heart, and I’ll tell you about them. Over the course of tonight’s post, and tomorrow’s. The newly married Bobbie and Allan Ramsay, after a top-secret ceremony right here at the Manse. As I write this post I am not two feet away from where they were standing. And I was there for the great (top-secret) event! It gives me goosebumps sometimes, the history in this house. Bobbie’s sister Barb is an absolutely lovely person who, though she now lives about an hour’s drive away, keeps close ties with Queensborough, is a go-to source of information about our hamlet’s history, and is kind enough to read and sometimes comment on my ramblings here at Meanwhile, at the Manse. In fact, those ramblings kind of led to her gifts. For which I will forever be grateful. Anyway: where was the shower held? Why, Queensborough, of course; I’ve already mentioned that Barb was a Queensborough girl. And where, more specifically? Why, at the one-room schoolhouse; that historic (built 1901) building was (and is to this day) our community centre. It was where the Women’s Institute met, where euchre parties were held, where we have the annual spring pancake breakfast – it was at this past spring’s pancake breakfast that Barb passed on these treasures to me – and where community bridal and baby showers have taken place since … well, probably since 1901. All the women and girls from the community would come. All the just-unwrapped gifts would be passed around the circle of attendees so that we could ooohh and aaahh over the tea towels and dishcloths and whatnot – hey, those were simpler times, and practical gifts were needed and welcomed! And most importantly, the bows from all the gift wrapping were stitched to a paper plate by an able assistant sitting beside the bride-to-be, and at the end of the evening that blushing young woman would don the finished product and wear it as a colourful hat. That, my friends, is fine old-fashioned community fun, all focused on (and enjoyed by) the women of the community. And I miss those days. Okay, on to “the drawing” that Barb mentions. It is a black-and-white sketch of Hazzard’s Corners United Church, a beautiful and historic old building just up the road from Queensborough that I have written about many a time; here and here are just two examples. The drawing is by the late Vera Burnside, a woman who in my view was, and is, like Bobbie (and Barb), a model of strength, beauty, brains, talent and resilience. Vera, a schoolteacher by training, lived in the Hazzard’s area but, after that church closed in 1967, attended and was very active in St. Andrew’s United Church in Queensborough. She taught Sunday School (including brats like me), was active in the UCW, and just generally was busy doing useful and helpful things for church and community. And (to boot) was an accomplished artist! Here is my post about finding, and being fortunate enough to be able to purchase, a Vera Burnside original painting at an auction. That painting is not five feet away from me as I write this. It makes me happy, and happily reflective, every time I look at it. Which is many times a day. 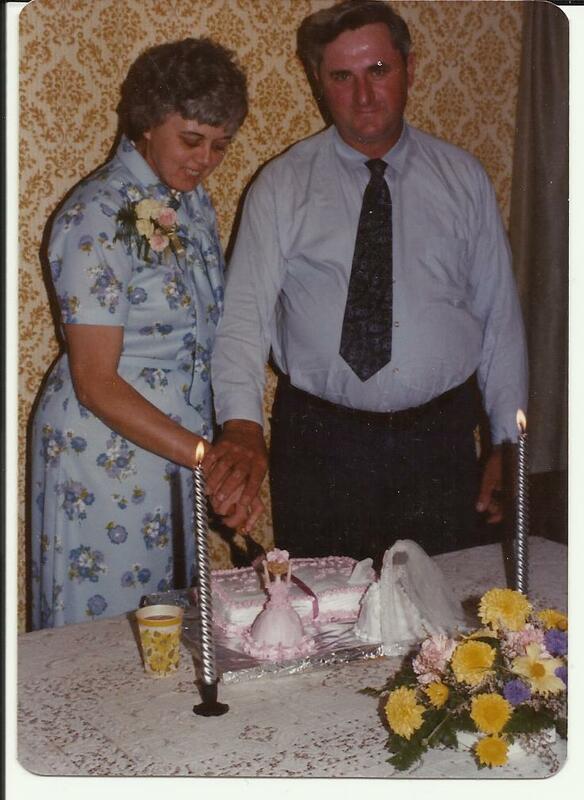 As I write all of this, I am struck by how all the players and characters in the stories – Barb, Bobbie, Vera, the women and girls who took part in the bridal and baby showers at the schoolhouse, me – are female. Yes, this is history. Community history. 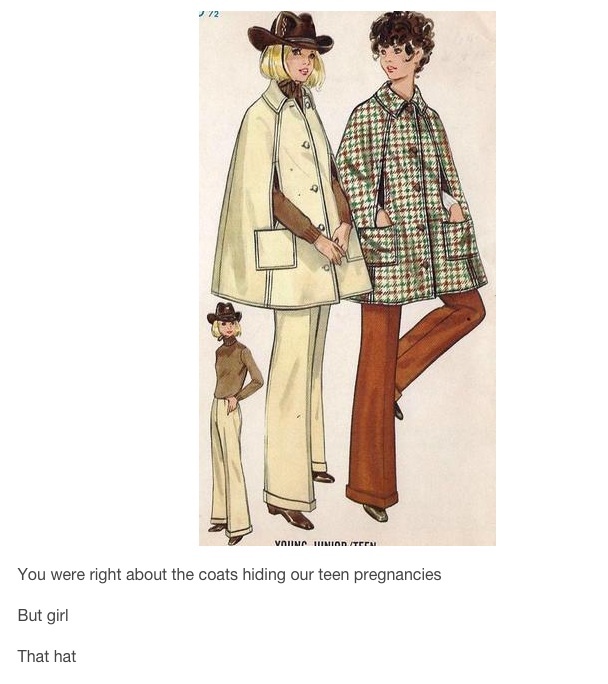 But also – it is women’s history. Women in tiny rural places like Queensborough. Their history – our history – often gets short shrift in the overall scheme of things. People, I think we are on to something, thanks to inspiration from my friend Barb and her wonderful gifts. Tomorrow, Part 2, and it’s a good one: the Queensboro Cook Book! The scene on the front lawn of the Manse this afternoon: what was that Sedgwick woman up to? If you happened to be in Queensborough today and drove or walked or biked by the Manse, you might have found yourself wondering what on earth that woman was doing in the front yard with a bucket of water and a deconstructed chest of drawers. Well, since that woman was me, I’ll tell you. I was trying to get the musty smell out of that chest of drawers, which Raymond and I bought a while back at an auction. After we got it home to the Manse we wiped and vacuumed it out, and put it upstairs in one of the spare bedrooms. (“The boys’ room,” Raymond and I call it, because it was the bedroom that my younger brothers John and Kenneth – you can see a cute photo of them at the bottom of this post – slept in when we were kids growing up in this house.) And we didn’t think too much more about it. But in recent days I’ve developed a determination to get my clothes (of which I have way too many, like most 21st-century North Americans) actually put away in closets and drawers, as opposed to the alternative, which is messy piles and whatnot. Now, this is easier said than done in the Manse, because chests of drawers and closets are in extremely short supply; when this house was built in 1888, people just didn’t have all that many clothes. I, on the other hand, do have lots of clothes, and that’s why I decided it was time to put that auction-sourced chest of drawers to use. Unfortunately, when I opened one of the drawers up, I was taken aback by the musty smell that came out. No way was I putting my nice clean sweaters in there. And that’s why you might have seen me out in the front yard with the drawers taken out of the frame of the chest and the frame itself upside down. Employing a de-mustifying method that I totally made up, I scrubbed everything down with a combination of very hot water and Murphy Oil Soap. Then I left everything out in the hot sun and the steady breeze so that they would dry out and in the process (or so I hoped) the smell would dissipate. By the end of the afternoon, when we moved the pieces up onto the Manse’s front porch, they definitely seemed to smell a lot fresher, but I think another scrubdown and day in the sun might be in order. Or – is there a better way? One suggestion I heard today was boiling water followed by hot sun. Or would industrial-strength vinegar and water be a good idea, I wonder? If you have any suggestions, please send them along. Because, you know, if this doesn’t work out, that chest of drawers is off to the dump. And I am off to Ikea. 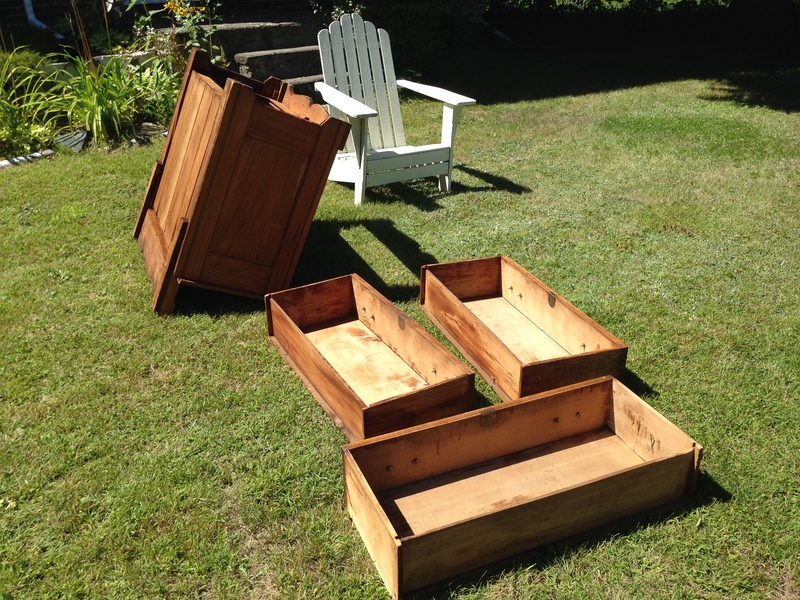 Meanwhile, I have made a mental note to self: before you buy, or even bid on, a piece of old furniture at an auction – or anywhere else – for goodness sakes open up the drawers and sniff! I may have more copies of this book than anyone alive. Given my many reports (like here and here and here, for instance) on the size of the book collection that Raymond and I have amassed between us, you can probably guess what my answer is. My childhood books are among my dearest treasures. 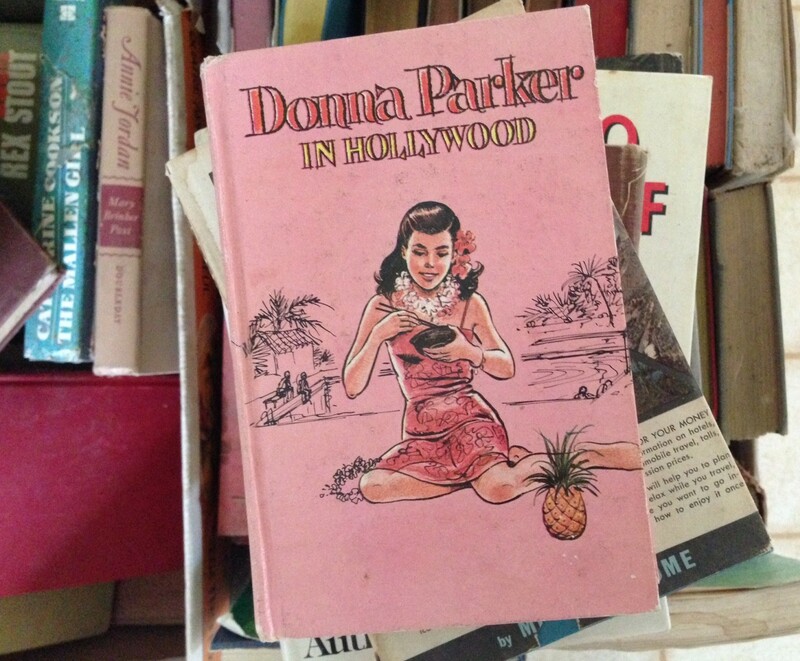 I acquired Donna Parker in Hollywood when I was maybe eight or nine years old, growing up in the Manse where I now live once again. And I am almost certain that it was a purchase I made from the fairly limited book selection at McMurray’s General Store in Queensborough. I expect what attracted me to it was the pink cover and the image of that perky American teenager apparently doing something exotic: you know, tropical flower in hair, swimming pool in the background, tropical fruit in the foreground and – most exotic of all – she is eating with chopsticks! (People, that is not something one did in Queensborough, Ont., when I was growing up there.) Truth be told, I still find that cover pretty appealing, although now it’s for the sheer retro-ness of it. I forgot the plot of Donna Parker in Hollywood many decades ago, except for the general drift that Donna was lucky enough to be able to travel from her home (wherever that was; the Midwest maybe?) to exotic and exciting Hollywood. Where she of course had adventures. But though the details are long gone from my memory, the book itself remains firmly in my possession – and it is all the more precious because it came from long-closed McMurray’s General Store in Queensborough. The first time I saw another copy of it for sale, at one of the antiques warehouses that Raymond and I love to visit, I was awfully tempted to buy it. Of course I told myself that was dumb, since I already had a copy. But something in the back of my mind kept whispering, “Backup copy!” So: did I resist the temptation? Of course not. And besides, it was only five bucks or so. I think my third copy came about because, at the time I found it in an antiques barn, I couldn’t quite remember whether I’d purchased the first backup copy or not. And since this latest one was only about three bucks, I figured what the heck. But I felt kind of sheepish when I got home and realized that I now had three copies in total. And then a couple of weeks ago, at an auction, I failed to resist the temptation to buy several boxes of books (because that was how they were being sold – a whole box of 20 or so books at a time) for just a few bucks per box. And what did I discover at the bottom of one of those boxes when I’d brought them all home? You guessed it. Donna Parker in Hollywood. Copy #4. That’s the one you see in the photo. Hey: is Donna following me around? Do you remember having to put covers on your textbooks? Given the rather impressive ink spill, I guess it is just as well that this old textbook (The Canadian Speller, Book Two, Forms IV and V, published by W.J. Gage & Co.) had a student-installed cover. Note the ad for the Stirling Creamery, still producing astoundingly good butter all these years later! The other night I wrote about the magical sensation of hearing the cry of a whippoorwill again after well over 30 years. In that post I mentioned that the occasion on which I heard that wonderful sound was a quiet evening at the Manse when Raymond and I were examining some books he’d bought at a local auction. Well, I must tell you that the occasion brought around not one but two pieces of nostalgia for me: the first, of course, the whippoorwill’s song; the second, the schooldays when we students had to put covers on all of our textbooks. The textbooks were used year after year after year, which was always evidenced by the fact that inside their front covers you would find, pencilled in in schoolchildren’s handwriting or printing, several names. Because of this necessary (for economic reasons) re-use, the schools tried to keep the books in as good nick as possible. Which meant that we students were handed the responsibility of putting covers on them, to keep them from getting more beaten up than absolutely necessary. “This School Book Cover Is Given To You With The Compliments of the Advertisers,” it says inside the cover, adding: “Support Home Industries.” Still a good sentiment! Hannah’s Dairy: Pure Pasteurized MILK and CREAM. 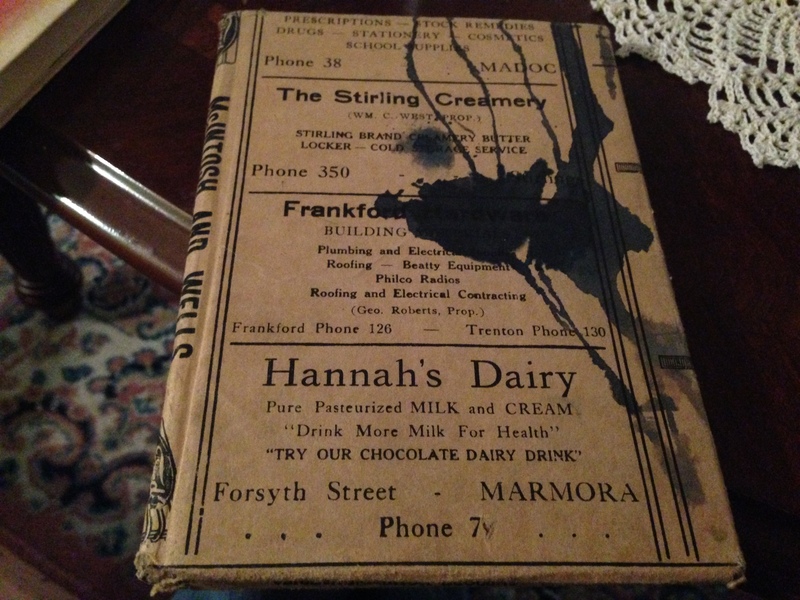 “Drink More Milk for Health” “TRY OUR CHOCOLATE DAIRY DRINK” Forsyth Street – Marmora. Spry’s Lunch Bar: Lunches – Fish and Chips. Ice Cream. Candies. Cigarettes. [On a Grade 7 textbook!] Regent Gas Station. For the Finest Gas – Oil. Phone 283 Madoc. Royal Hotel: Marmora – Ontario. Comfortable Rooms. Excellent Meals Served. H.J. Neath, Prop. And perhaps my favourite (because it is an old family business that is still going strong, though very recently sold), Johnston the Druggist: Prescriptions – Stock Remedies – Drugs – Stationery – Cosmetics – School Supplies. Phone 38 – Madoc. People, this is (perhaps excluding the mention of the cigarette sales) seriously good stuff. Such nostalgia! 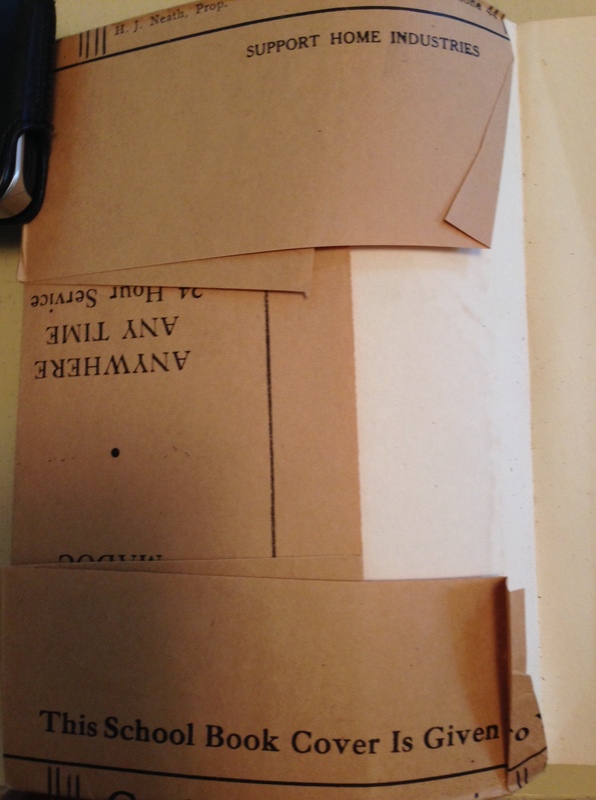 I am happy to report that the young man who installed the covers on his books (and who many years later would have an auction sale, at which Raymond would buy those books) did a very fine job indeed. Way better than I ever could have. And so I applaud him for that; and I thank him for inadvertently reminding me of a bit of lore from my own long-ago school days that I would otherwise probably have forgotten. And, dear reader, that perhaps you would have also.